What you don’t know could put you or your dog in danger. Any dog – it could be your very own dog, your family’s dog, your friend’s dog, a neighborhood dog or a dog you’re volunteering with at a local shelter – can bite. As humans, we assume that dogs greet and communicate the same way that we do – in a very frontal manner. Think about it: When greeting someone, proper human behavior is a handshake, hug, eye contact and a smile. All of these behaviors, while perfectly acceptable in our minds, are often perceived as menacing and threatening to dogs. This is because frontal approaches are actually very rude and intrusive in the canine world. Seeing human “greeting” behaviors from a dog’s perspective, it’s not hard to understand why a canine might feel the need to defend herself. Yet, when a dog bites in self-defense, people often claim that the bite “came out of nowhere.” In reality, dogs typically give many warning signs that they are uncomfortable and willing to defend themselves, if need be. You just have to know what to look for! You can prevent a dog bite from happening. The best way to prevent a dog bite is through education, self-awareness and interacting with dogs in a manner that is non-threatening to them. Know the signs. Familiarize yourself with the warning signals dogs typically offer when they’re uncomfortable and prepared to defend themselves. Always be self-aware. Remember that a dog’s body language is a constant conversation and it can change in an instant. Dogs can easily become uncomfortable by something you do or something that happens in the surrounding environment. For example, perhaps a loud car goes by outside and scares the dog as you’re petting them. Or perhaps you unknowingly begin petting a dog in a spot that’s sore. If a dog’s body language tells you they’ve become uncomfortable, stop what you’re doing immediately and give them space. When first meeting, kneel down parallel to the dog. Don’t “square off” with a dog by facing her directly with your full body. Avoid direct eye contact and offer soft and slow blinks – this is something dogs perceive as submissive and works as a calming signal. If the dog allows you to approach, gently pet her underneath her chin, on her chest or her back (don’t reach over her head). These are the spots where dogs are most comfortable being touched. Do not go in for a hug or a kiss. Do not grab at or touch the dog’s face. 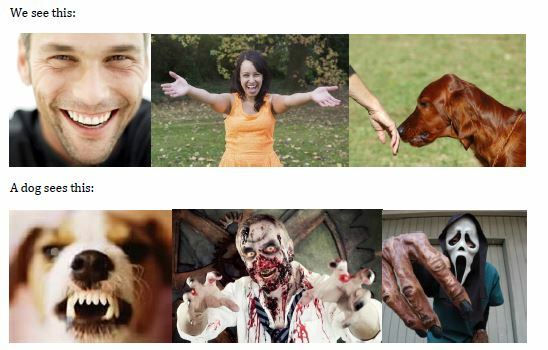 Although these are gestures of endearment for humans, dogs don’t know that and perceive these behaviors as threatening. Never approach a dog who is sleeping, eating, chewing on a toy or bone or caring for puppies. Always ask the pet parent first before petting the dog. Children are especially vulnerable around dogs. 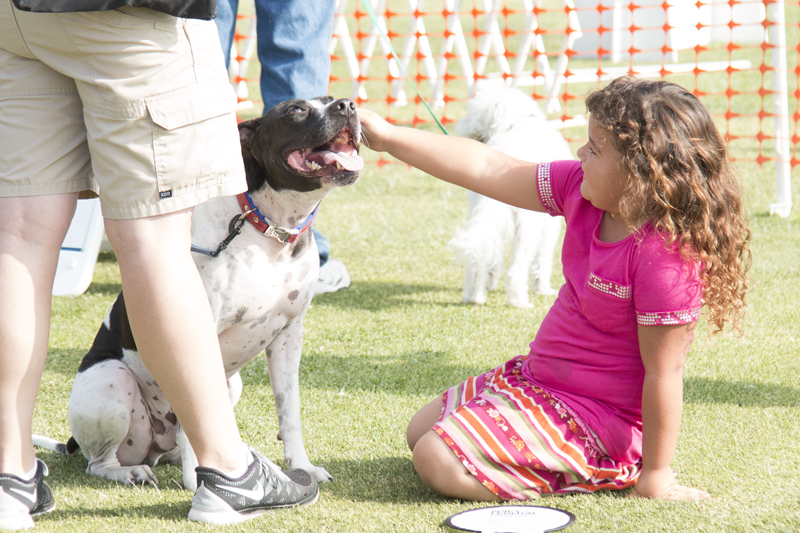 Teach your child how to interact with dogs and about B.A.R.K. – Be Aware, Respectful and Kind. If you're bringing your dog in social situations, consider how to keep your dog safe too. If you have a pet behavior question or would like some training assistance, San Diego Humane Society is here to help! Visit our behavior and training options online, or call our Behavior Helpline at 619-299-7012 ext. 2244 to speak with a trainer.